Clinical practice guidelines are systematically developed statements based upon prevailing evidence to assist health practitioner’s in their decisioning making concerning the appropriate care to be provided for a specific clinical circumstance. A guideline is meant to offer concise instructions on how to provide healthcare services. The most important benefits of clinical practice guidelines are their potential to improve both the quality care and patient outcomes, and reduce costs. However, these guidelines are developped and communicated in prose, which often lacks the required specificity to clearly and unambiguously convey the clinical knowledge. These ambiguities can lead to the misapplication of intended therapy, causing at best a reduction in the quality of care and reduce costs, at worst causing harm. 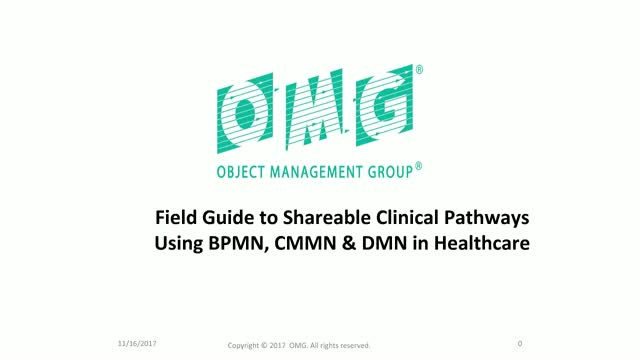 This presentation will demonstrate the use of three OMG standards, Business Process Model and Notation (BPMN), Case Management Model and Notation (CMMN) & Decision Model and Notation (DMN) to represent clinical guidelines. These methods in tandem provide a means to clearly and unambiguously describe and convey the clinical knowledge. The models can be reviewed, tested and computational verified. Further, since there are clear computation semantics for the standards, the models developed based upon these standards are potentially executable. This promotes the rapid dissemination and uptake of the guidelines in a clinical setting. The speakers will provide a brief overview of the three methods, supporting HL7 standards and supporting technologies necessary to make the guideline actionable in a clinical setting. A simple clinical model based upon the standards will be reviewed and finally shown executing. The presentation will show the potential of using these methods to model clinical knowledge and their potential of being directly executable.